Somen are a thin, white wheat noodles and very in Okinawa. 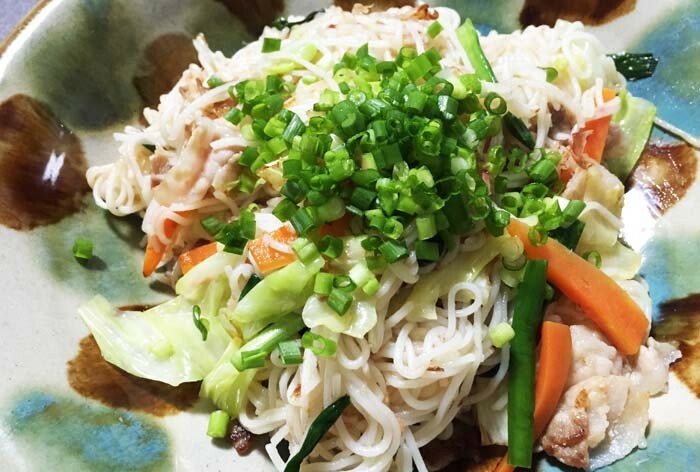 In mainland Japan, people eat somen noodles with a dipping sauce but in Okinawa, it’s more common to make fried noodles or put them in a soup. You can make a really quick fried noodle dish as somen only require 2 to 3 minutes boiling time. 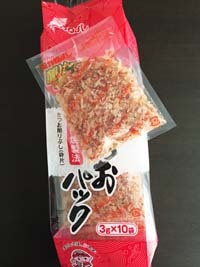 Packs of bonito fish flakes. 1. Boil water in a saucepan and cook the somen noodles for 2 minutes. 2. Once the noodles are cooked, drain the water in a sieve and sprinkle 1 tbs sesame oil over the noodles. Mix the noodles with the sesame oil to prevent them sticking to each other. 3. Heat 1 tbs sesame oil in a pan and cook the pork belly with awamori. 4. Once the pork is cooked, add carrot and heat it through, then add cabbage and Chinese chives. Cook until the vegetables become soft and cooked. 5. Add the noodles and bonito fish flakes and mix well. 6. Dish up and sprinkle scallions on the top for garnish. Let’s roll-sushi class ¥5,000 Tuesday, Oct. 13th and Saturday Oct. 17th. Introducing Japanese Cooking 3-week course starting from Oct. 13th. Facebook: facebook.com/cooking.school.with.nao Tel: 098-955-5311 Address: 1414-61 Sobe, Yomitan Village, Okinawa 904-0304. Closed on Sunday.